The season just wouldn't be the same without a display of christmas flowers. Brighten your home with a festive bouquet, basket or live tree, and let the magic of the season take over! We also feature a great selection of more Christmas ideas at the bottom of this page. Just click on the pictures for great prices. The joy of Christmas past is stunningly evoked in this beautifully hand-crafted sleigh. 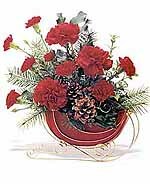 Nestled in its graceful scrollwork is a textured red liner which cradles a bright bouquet of festive holly, vibrant carnations and fragrant pine branches. It's a very merry gift and a terrific value. These exclusive handcrafted basket Christmas trees are woven from narrow strips of real wood. The unique curlicue pattern creates the appearance of evergreens, without you having to worry about the need to vacuum up annoying needles. They makes a terrific centerpiece or window display, and are perfect for coffee table holiday decor. Their design enables them to be nested, allowing for compact off-season storage. The large tree is 22 and a half inches high, the medium one is 18 and a half inches high, and the small tree is 15 and a half inches high. Their steam bent banded wooden bottom gives good stability. Nothing says Christmas more than this decorative holly bowl. With its bright green waxy leaves, holly makes the season quite jolly. 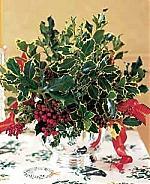 Green and variegated holly is tied with holiday ribbon, and delivered in an a classic bowl. Size is approximately 15" W x 17" H.
A lovingly detailed partridge roosts atop a pear tree in a festive display reminiscent of the much-loved Christmas carol. Hang your treasured heirloom ornaments from the 16 branches, or display the holiday pears included. The finely spiraled tree trunk has rubber feet to prevent surface scratches. This attractive and unusual tree is equally perfect as a home display at Christmas or an ideal heirloom gift. The branches are removeable for easy storage. The magic of Thomas Kinkade's Sunday Evening Sleigh Ride is magnificently captured in this hand-painted cottage, illuminated from within by a golden light. This is a must-have gift for lovers of the world's best-selling living artist. 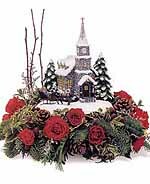 The third in our successful Kinkade Christmas series, the chapel is surrounded by a wreath of roses, carnations, fresh pine sprays, holly, and pine cone accents. The recipient of this herbal tree will love how it spices up their holiday decor. Known as the "herb of friendship," a rosemary plant is an ideal gift for a friend's kitchen, where pieces of the savory foliage can be added to culinary specialties (or tucked into sachets to freshen drawers and closets). The rosemary is carefully shaped into an aromatic, 15 to 18 inch tall Christmas tree (height includes the attractive basket which your tree is presented in), and can be decorated with small ornatents or ribbons for a living festive centerpiece. In the spring, it can easily be planted in the garden for lasting years of enjoyment, and can be over-wintered indoors in colder areas. Say Season's Greetings with a cheery Candy Cane Christmas Bouquet Basket of fresh pine, traditional red and white blossoms, and festive holiday trim. Nationwide USA delivery is available after Thanksgiving to Christmas. There's nothing like a little decorated tree to liven up the holidays, and this one will definitely rouse the room. 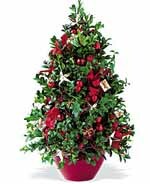 This 22 inch manufactured boxwood tree decorated with berries, balls, apples, stars and ribbons arrives in a red jardiniere. Overall dimensions are approximately 12 inches width x 22". This classic winter wreath will greet Christmas visitors with the warmest of wishes. Just the right touch, the 24" evergreen wreath arrives decorated with berries and pinecones, and is tied with red velvet ribbon. Size is approximately 24" diameter. With shiny, silver stars shooting out of beautiful winter evergreens, this Christmas arrangement is like a dream unto its own. 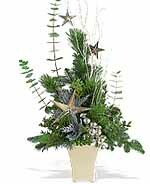 Eucalyptus, fir and pine, decorated with silver stars and balls, arrive in a tasteful ceramic vase. Size is approximately 17" W x 12" H.
Please bookmark Piglette for all your future gifts for all occasions including roses, flowers and many unique and unusual presents at great prices.